I stepped out of Moor Park station to a slightly less oppressively hot day. 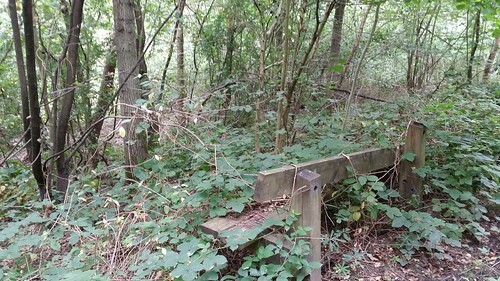 Back down the wooded path alongside the tube line, some clear damage sustained since I last passed this way. Across the railway and through the streets of Northwood, I arrived at Batchworth Heath and went looking for a hill I’d seen marked on the Social Hiking map for this area, finding it tucked away down a residential road behind the pub. 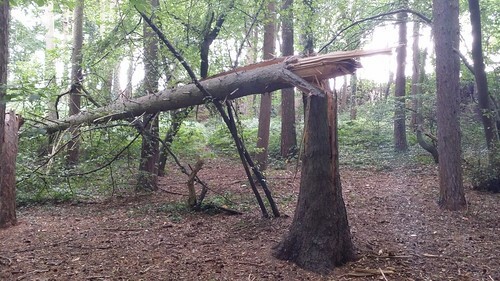 Some thwacking through undergrowth and brambles was needed to reach the earthy bank dividing the ground from Moor Park Golf Club. somewhere along this bank was the actual top, but I’d got close enough for it to register. Farmland followed, before the path met up with the Hillingdon Trail, with which it would flirt on and off for several miles. 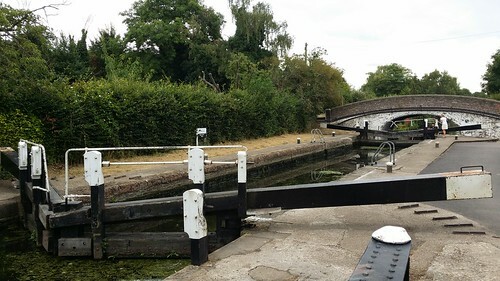 I descended to the road and before me was the Grand Union Canal and beyond it the patchwork of lakes that forms the expanse of the River Colne at this stage in its life. Unlike some people, I could walk alongside a canal for hours on end. It’s easy flat walking, usually on decent quality paths. There’s boats and birds aplenty to see. Some would call it boring, but I appreciate the chance to let my mind drift off in pleasant surroundings while I crank out the miles. I settled down to enjoy the steady plod along the towpath. 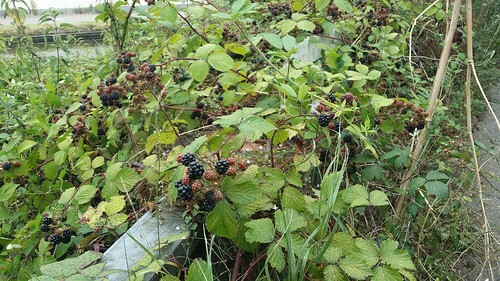 All along the towpath, and indeed everywhere on today’s walk, was evidence of this year’s harvest in the form of heavily laden blackberry bushes. No effort required to reach them, I could almost grab a handful without breaking stride. It was rude not to sample such wares so freely available. I continued on, blackberry juice staining my chin. As with all canals one of the fascinations is locks. A boatload of people were just rocking up to ascend this staircase and I slackened my pace to watch their efforts without trying to put too much pressure on them not to mess it up. As I passed over the low bridge, another boat caught up and snuck in alongside them, saving themselves the effort of undergoing the whole procedure from scratch. A short way downstream, and things became substantially wilder and more dangerous. 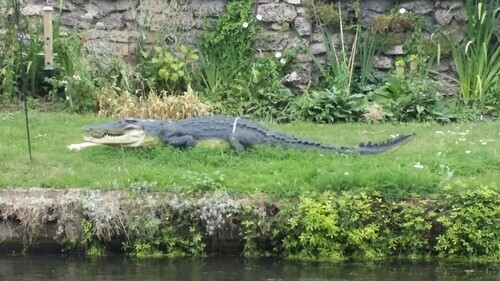 A crocodile (or alligator as I’m no expert and prefer to observe such beasts from a safe distance) stalked the opposite bank. I put my faith in the width of the canal and the fact that the vertical side of the canal would buy me a few extra seconds. The path reached a road bridge and then did something really irritating – it felt the need to detour along that road and then walk me through a dismal former quarry, rather than do the simple (and in my view better) thing of sticking with the canal (reptilian predators aside). No benefit was gained from the detour other than increasing the length of the London LOOP by maybe half a kilometre. 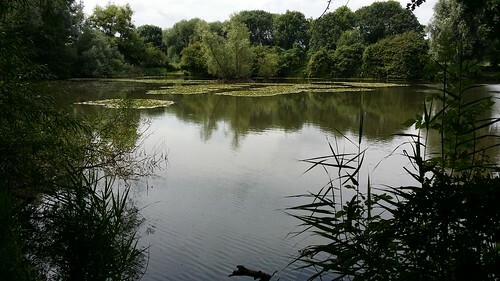 Lunch was taken overlooking one of the River Colne lakes. 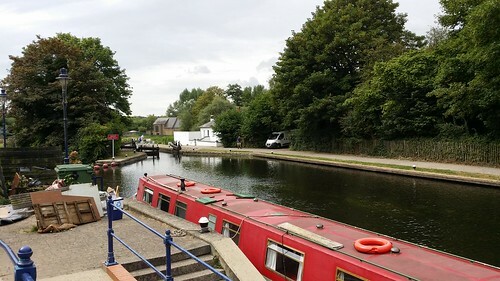 Lunch done, and soon the detour was too, and I happily rejoined the canal, spending the next few miles all the way to Uxbridge alongside. Irritating diversion number two then reared its distinctly ugly head, and I found myself heading away from the relative tranquility of the canal to the brash clamour of an industrial estate, and not one of the finest examples of its breed either. It was obvious from the width of the path and the vegetation that most people simply stuck with the canal – there was nothing here of interest. 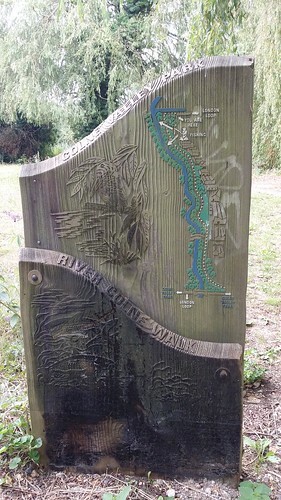 As the path left the industrial estate itself behind, a sign proudly announced that I was following the River Colne Walk. The walk gradually became a bit more interesting with lakes opening up through the trees, but all too soon this was over and I was on a path linking back to the Canal. As I strode once more along the canal, a man coming the other way stopped for directions. He’d walked from Hayes in search of narrowboats, and was quite crestfallen when I told him if he continued the way I’d come he probably wouldn’t see any for at least an hour. Naturally, within 5 minutes of leaving him behind I saw plenty, and how he’d managed to miss them I’ll never know. People really should look around them when they walk. The delights of the canal were starting to fade, not enhanced by a couple clearly attempting carnal activity under a bridge, and right on the path. With my feet aching I decided to call it a day, and stopped at West Drayton. Noticed the other day they’re still going strong, but looking a little manky in places.